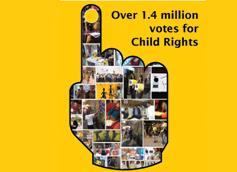 The year 2013-14 has been another eventful one, and we are happy to share with you more information about the change you have enabled for children. Children have always been our priority, and in the year gone by CRY UK has been able to transform the lives of 22,174 children based in the Gujarat and Jharkhand regions of India through our projects Jago and GSS (Gram Swaraj Sangh). Across 185 villages , CRY UK has been able to bring a wave of change in many ways. 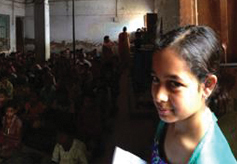 Children like Dipti went on from being a brick kiln labourer to rejoining school. Her story is just one example of how children's collectives can play a key role in bringing change. CRY UK also supported the efforts of our partner, CRY India in addressing the crisis that emerged after the Uttarakhand disaster. Timely intervention ensured over 800 children in some of the worst-affected villages in Chamoli and Rudraprayag received the much-needed relief. A rehabilitation plan was put in place to help them get their lives back on track. With so many activities happening we have added new members to our team to strengthen our efforts. Akila Lingam, who has over 20 years of experience in the private, public and the NGO sectors joined CRY UK as a trustee. We have with us Irvind Gujral who will manage the Corporate Fundraising and Major Donors portfolio and Anuradha Dhar Bose who will be responsible for Events and Volunteers. We welcome the new team members. We would like to continue what we have set out to do, ensure change in the lives of many more children, and we count on your support to enable this change. Do not forget to read young Reyna's project visit experience where she shares what she thinks will help ensure more girls to complete their education. We would like to hear from you too. Do share your ideas, thoughts, feedback with us at cry.uk@crymail.org. 15 kms from Giridih, in East India is the village of Kovad. Dipti, a part of an 8 member family hails from Kovad. Dipti has lost her father and her mother eked a living as a daily wage worker. Poor economic conditions of the family forced 13 year old Dipti and 3 of her sisters to drop out of school. She began to work with her mother in the brick kilns. The Jago team when they heard of this, spoke to Dipti's mother and tried to pursue her to send the child to school. The children's group in the village especially played a key role in persuading Dipti's mother. The efforts bore fruits and today Dipti is back to school. Dipti is one of the many children, whose life has changed because of the intervention by team Jago. 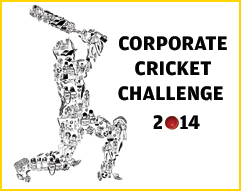 In its 10 year now, we are excited to announce the CRY Corporate Cricket Challenge 2014 to be held between May 10th and 28th June. It is one of CRY UK's annual fundraising events. All funds raised through this event will go towards CRY UK's projects in India that work with children to ensure a lasting change in their lives. We want to thank all the volunteers who organized this event all by themselves and made it a success. Five enthusiastic teams participated in this event and £1800 was raised. Team Mesopotamian Lions and Team Super Sharp Shooters played each other in the finals. £9000 was raised through the Corporate Cricket Challenge held in Summer 2013. The event saw six participating teams from London's leading corporate firms in the IT, Consultancy and Banking sectors. (Oracle, ICICI, Cognizant, TCS, Arcelor Mittal and Lebara Lions). Find out more. To mark the launch of the brand Ashoka Maurya, Fashion Designer Ash Gangotra has teamed up with CRY UK. For every item of clothing sold worldwide, a £3 donation will be made directly to CRY UK, towards ensuring children's right to education, quality healthcare, protection and participation in India. Find out more. Our partner in India, CRY has garnered over 1.4 million pledges, unanimously demanding for making children the nation's priority. More than 3000 people in villages across India along with CRY project partners, volunteers, youth and student groups in colleges, over 35 celebrities, employees from nearly 30 corporate offices, networks and groups organized activities and events. 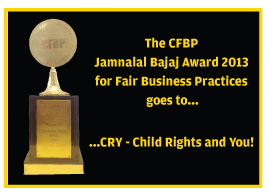 Our partner, CRY in India added yet another accolade to its repertoire, by receiving the Jamnalal Bajaj Award for Fair business practices in the NGO Category at a ceremony in the financial capital. The Council for Fair Business practices (CFBP) Awards recognizes Indian Business Entrepreneurs for their outstanding achievement/ contribution in adhering to the highest ethical practices and providing complete satisfaction to consumers and other stakeholders. Kadwa Patidar Samaj : for raising £5000 through a Diwali Dinner hosted for its community members . The proceeds from this evening were donated to CRY UK who will utilise these funds to ensure adequate infrastructure, clean water, healthcare and most of all an education for children from their project Gram Swaraj Sangh in the Kutch region of Gujarat, India. Students for CRY group in Ireland raised £2384 for CRY UK : A group of Irish students 'Students for CRY' have been raising awareness and funds for CRY UK in Ireland since November 2012. Through various activities, they have raised £2384 for CRY UK so far. A big thank you to all of them for their support! My name is Reyna, I am the daughter of Prakash Jani, one of the volunteers from CRY UK. I have written to inform you of my experience at project Sahyog in Ahmedabad. When I visited Project Sahyog, i was taken aback. It was quite sad because the girls aged 14 and above were at home on sewing machines all day when they could be studying to be a doctor or a teacher. Some girls wanted to go to school, but issues like absence of transportation services, separate toilets for girls and lack of clean drinking water forced them to stay out of school. What relieved me was the fact that the younger children were still receiving education. Sahyog supported a nursery for children between 0-6yrs old and a primary school in the community. We visited a primary school not far from the nursery. The school has three classes and two teachers and most of the children have school meals from Sahyog. The children looked like they were enjoying themselves. Ambi, aged 14 is in the 6th grade. She goes to a government school with 35 children in each year group. She wants to go to a high school and aspires to become a police officer. She has 3 siblings. She makes incense sticks which she learnt at the age of 6 and sells them to a local shop. Her sister sews hems and laces on clothing at home for very little money. Ranu is 16 years old. She had to discontinue her studies in the 8th grade due to the school being far from her house and lack of facilities like proper toilets and wash basins. She stays at home and does chores and watches TV. She started cooking at 10yrs of age. She wishes that she could go to school. I suggest that the community should set up a secondary school in its vicinity which is fully equipped and has all the basic facilities required by girls. This will encourage girls to complete their education. Most girls want to study and achieve something, but cannot because of the roadblocks mentioned above. I'm very grateful to the Project leader, Robert Williams, for guiding us around the project and the CRY team for making it possible. An opportunity for you to share your special day with underprivileged children and enable lasting change in their lives. To know more and to create your very own My Occasion page, click here. This is a simple yet cost effective donation option for charities. It does not require ongoing paper work from you. It's just a onetime set-up. Opting for this scheme will enable automatic monthly recurring donations from your Bank account directly into CRY UK's Bank account. This enables you to be a part of a charity that believes in changing children's lives forever. To set up Standing Instruction Scheme on your bank account, please click here. Adopt a Hamlet and you can ensure all children in a hamlet have the right to childhood. Find out more. Join us, and you can help ensure that every child in India, regardless of race, religion or background, has a fulfilling and enriching childhood. Find out more about the different ways you can give your time to CRY UK.